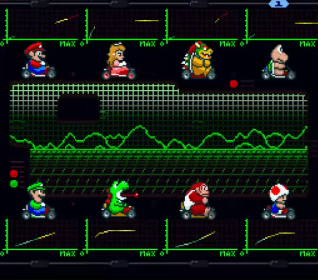 Super Mario Kart: F1 Tracks is a Super Nintendo ROM hack based on the Super Mario Kart SNES game. This hack changes the tracks to ones that deviate from Formula One racing. This is a hack of Super Mario Kart, the very first of the long-running friendship-ending kart-racing series starring everyone’s favorite ex-plumber. 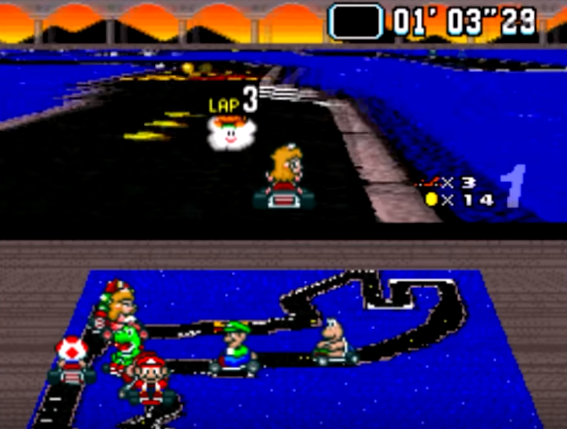 In this hack, all of the tracks from Super Mario Kart have been altered to reflect those seen in Formula One (or F1 for short) racing. While the core gameplay mechanics remain the same as in the original, there is a bigger focus on mastering the abilities to drift and make sharp turns. This is thanks to the curvier nature of the course design. The characters remain unchanged. Mario and the gang are as you remember them from the 1992 classic. There are also some new environments some of the tracks take place in. Beaches and circuits return from the original, but newly introduced are deserts and industrialized racetracks. The character select is also given a fancier electronic style. Most importantly, the gameplay is still classic Mario Kart. Do keep in mind this is Super Mario Kart, though. That means you can’t come in here with experiences from Mario Kart 64 or Mario Kart 8 and think you’ll hop right into this without needing to adjust. If you are a fan of the original Super Mario Kart, however, and are looking for a new set of tracks to test your skills, F1 Tracks may curb your cravings yet. It’s not a total overhaul of the formula you’ve grown to love, but the new layouts can add a fresh twist to the established fundamentals. Question : What is a SNES Rom Hack? Answer : A SNES ROM Hack is where someone has taken the original SNES Game and has modified it with new graphics / levels / characters. Some hacks are very good and can create completely new games, whilst others are not done very well and can even be unplayable. Question : Is this ROM Hack any good? Answer : I have played this game and I have rated it which you can see the result below. If you have played this game please use the submission form below to submit your rating. Question : Can I download and play Super Mario Kart: F1 Tracks SNES ROM Hack? Answer : Yes 🙂 You can download Super Mario Kart: F1 Tracks ROM from ROMHacking. The download links have been tested and are working at the time of posting this article, If you find the links don’t work please let me know by posting a comment below. Question : I have Downloaded The ROM Hack But What Do I Do Next? Now launch your emulator and then open the ROM and you should be able to play the hack. If the hack does not load you will need to patch the ROM file with the IPS file. Question : How Do I Patch the ROM File To Play? Answer : Watch this video which will show you what to do. You need to download Lunar IPS tool and run it then click on “Apply IPS Patch” then select the .ips file and click ok, then select the Rom file and the patch will then be applied. Now launch your SNES emulator and open the ROM file. Question : Where Can I Download The Lunar IPS Tool? 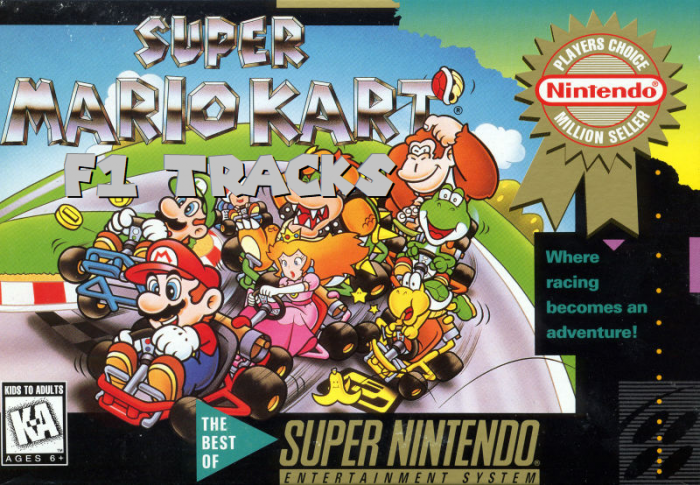 Question : What Emulator Shall I Use To Play Super Mario Kart: F1 Tracks (ROM Hack)? Answer : If you have played this game please let us know what you thought of it by submitting your rating below and also post a comment to let us know what you thought of this game. Question : Do You Have Social Media Accounts? Answer : Of course 🙂 We would love it if you would join us on the following sites.